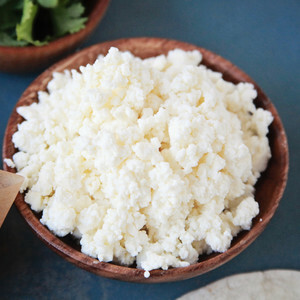 Cotija cheese is a hard, crumbly, fresh white cheese from Mexico. Cotija cheese, like many cheeses, is named for its city- Cotija, Mexico. Because it's so firm and doesn't melt, it's a perfect crumbling cheese for hot and cold dishes alike. It's made from raw sheep's milk and is heavily salted, bearing a flavor resemblence to feta. It has also been nicknamed the "Parmesan of Mexico." Because of its strong flavor, cotija is used to enhance dishes, but is seldom a dish's base. Cotija cheese is most commonly served on grilled Mexican street corn and is typically aged between three and six months.